Flat Foot Stooges is an early Three Stooges short film that has Moe, Larry and Curly working as firefighters, whose main job appears to be their preoccupation with getting their horse-drawn fire engine cleaned and ready for a contest. They not only clean the fire engine, they groom the horses – after taking them out for a steam bath. 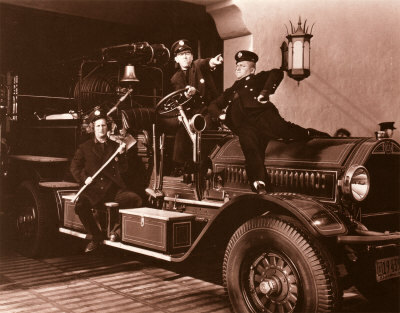 While they are out, an unscrupulous salesman is trying to get the fire chief, played by classic silent film actor Chester Conklin, to look into purchasing a new fire engine that doesn’t need horses. Fire Chief Chester Conklin isn’t interested, so the salesperson decides to get a little revenge by planting a bomb in the fire engine. The fire chief’s daughter catches him in the act, and while he tries to talk his way out of the situation, his plans are waylaid by a duck. A duck? Yes, a duck … that’s eaten some of the gunpowder he’s spilled from his bomb and lays an explosive egg, that sets the upstairs of the fire house on fire. It’s a little madcap as the fire fighters try to get to the fire, despite the “help” of Moe’s invention, a crazy device to automatically harness the horses – that doesn’t work. With a little creativity from Chester Conklin, they make it back to the firehouse in time to rescue the beautiful daughter (in a classic clown gag) and the villain gets his just desserts. A very funny short film and I rate it 4 clowns out of 5. Flat Foot Stooges is available on the Three Stooges DVD collection, The Three Stooges Collection, Vol. 2: 1937-1939. A final note – with silent film clown Chester Conklin as the fire chief, and the short film directed by another classic silent film clown Charley Chase, it almost feels like a reunion of classic film clowns. Curly (Curly Howard): I ain’t gonna take no shower! Moe (Moe Howard): Why not? Curly (Curly Howard): I don’t got my bathing cap! Moe (Moe Howard): Do you smell anything? Curly (Curly Howard): No, especially smoke! Curly (Curly Howard): That’s the first mouse I ever smelled that smelled like smoke. Moe (Moe Howard): What did you expect a firehouse mouse to smell like, a petunia? Moe (Moe Howard): This is my brainchild! Curly (Curly Howard): Ah, you’re not even married!